Do Radioactive Elements Glow in the Dark? In books and movies, you can tell when an element is radioactive because it glows. Movie radiation usually is an eerie green phosphorescent glow or sometimes a bright blue or deep red. Do radioactive elements really glow like that? The answer is both yes and no. First, let's take a look a the 'no' part of the answer. Radioactive decay may produce photons, which are light, but the photons are not in the visible portion of the spectrum. So no... radioactive elements do not glow in any color you can see. On the other hand, there are radioactive elements that impart energy to nearby phosphorescent or fluorescent materials and thus appear to glow. If you saw plutonium, for example, it might appear to glow red. Why? The surface of plutonium burns in the presence of oxygen in the air, like an ember of a fire. Radium and the hydrogen isotope tritium emit particles that excite the electrons of fluorescent or phosphorescent materials. The stereotypical greenish glow comes from a phosphor, usually doped zinc sulfide. However, other substances may be used to produce other colors of light. Another example of an element that glows is radon. Radon ordinarily exists as a gas, but as it is cooled it becomes phosphorescent yellow, deepening to glowing red as it is chilled below its freezing point. Actinium also glows. Actinium is a radioactive metal that emits a pale blue light in a darkened room. Nuclear reactions may produce a glow. A classic example is a blue glow associated with a nuclear reactor. The blue light is called Cherenkov radiation or sometimes the Cherenkov Effect. The charged particles emitted by the reactor pass through the dielectric medium faster than the phase velocity of light through the medium. The molecules become polarized and quickly return to their ground state, emitting visible blue light. 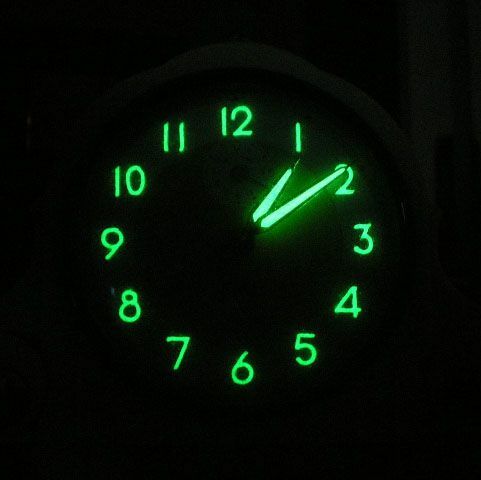 Not all radioactive elements or materials glow in the dark, but there are several examples of materials which will glow if the conditions are right.